Veni, Vidi, Blogi: I Came, I Saw, I Blogged: What's Cookin': Fagioli Al Uccelletto a.k.a. Tuscan Baked Beans. What's Cookin': Fagioli Al Uccelletto a.k.a. 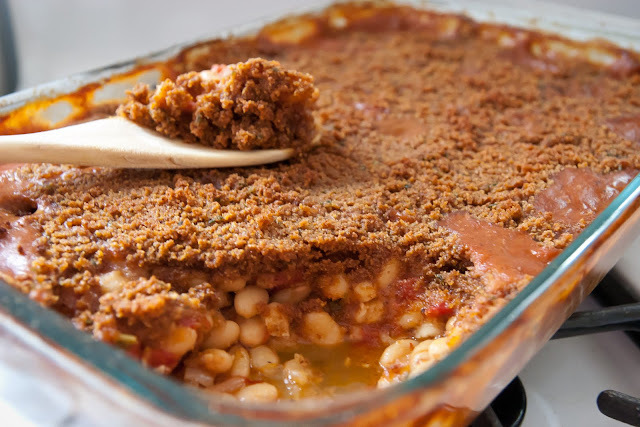 Tuscan Baked Beans. Not many of you responded to my last post (and I'm wondering why? Do I smell that bad? ), but those of you that did all said that you wanted beans before bathrooms. It is the natural order of things after all, isn't it? I found this recipe in the magazine that is sent to us from our local (lovely, huge, unique) grocery store/restaurant/food bonanza extravaganza shopping experience that will blow your MIND. Wegmans is THAT good. I wish every town had one! Wegmans Menu magazine is always a treat to read, it's full of dozens of great recipes and lovely photos that always make me drool. I also love that there are usually a large number of vegetarian recipes to dog ear, and I find myself adapting many of the meat dishes as well. Even though the recipes are intended to get you to purchase the Wegmans brand of "special ingredient", I know that you intrepid readers can find (or make) equally tasty substitutions. Personally, I love trying new ingredients, so I find the ingredient lists to be great opportunities to try things I wouldn't normally include in my grocery list. The special ingredient in this recipe is Wegmans Basting Oil, which is from my understanding, just a fancy name for grapeseed oil mixed with herbs. In any case, it's a tasty concoction and if you are near a Wegmans I'd urge you to look for the bottle near all the other cooking oils. 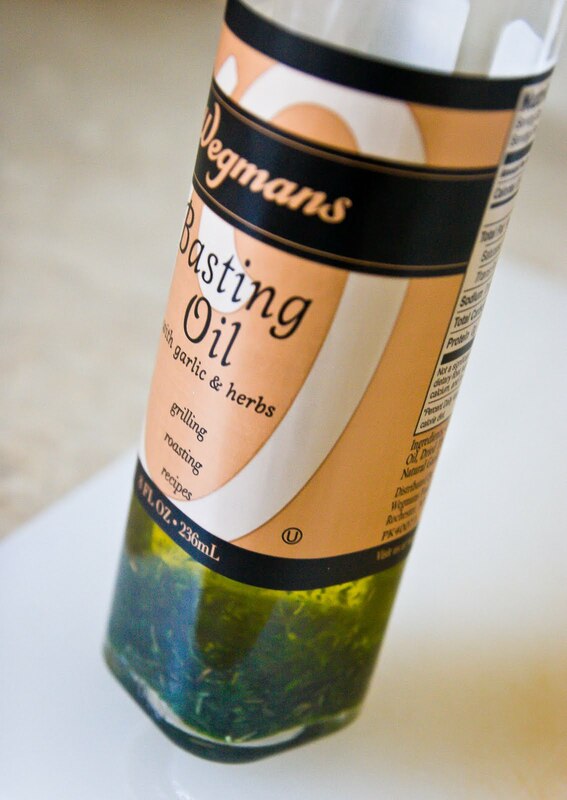 I've asked some Rochester natives what they use their basting oil for other than this recipe, and they've said that it pairs equally well with meats (grilling, roasting and braising), in salads, with slow-roasted veggies such as squash and of course grilled summer vegetables as well. Think of it as an extra layer of flavor for your regular recipes, if you're looking to change things up in a subtle way. On to to the recipe! This one is to die for good. It makes a TON of food, so be prepared for leftovers (which are always welcome at our house). 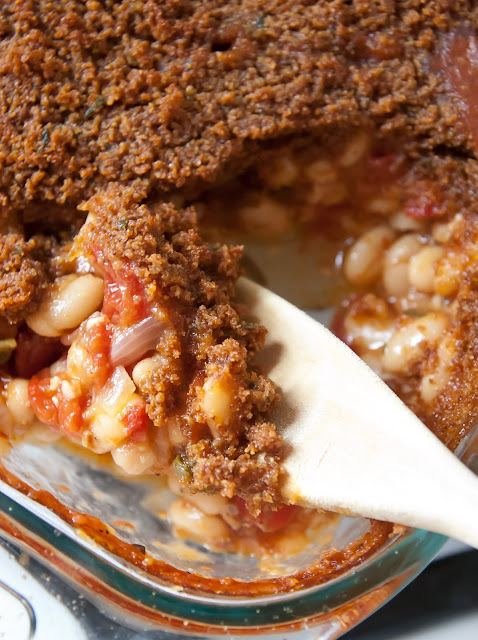 Tuscan baked Beans are filling, flavorful, and surprisingly little work if you know where to look for shortcuts (I'll mention those as we go along). They do take a long time to cook, but there's not that much actual prep time (shortcuts! It's all about the shortcuts!). This recipe is definitely going into our regular rotation, and I hope you enjoy it as much as we do! Drain beans, discarding soaking water. Add beans and 9 cups fresh water to medium stockpot. Heat on HIGH uncovered, until boiling. Skim as much foam as possible from surface. Add 4 sage leaves, and 1 sprig of rosemary; reduce heat to MEDIUM. Cover, tilting to vent steam. Cook 1 hour; do not stir. - Heat 1/4 cup olive oil in braising pan on MEDIUM. Add onions and garlic. Cook, stirring occasionally, about 5 min, until tender. Chop remaining 20 sage leaves and sprig of rosemary (I used all 24 leaves and both sprigs of rosemary because I didn't do the previous two steps). Add to onion mixture in braising pan. Cook for 1 minute. - Add tomatoes and salt and pepper. Simmer 10 minutes, stirring occasionally. Remove from heat. - (Skip this step if using canned beans) Check beans for tenderness; they should be completely tender. If they are not, cover completely; cook additional 15 minutes or as needed. - Preheat oven to 375 degrees. Add beans and liquid to onion mixture in braising pot (or in your big pan), stir to combine. This is when I poured the entire mixture (beans, liquid, onions, tomatoes and herbs) into my 3 qt. baking dish. It filled nearly the entire thing - so be sure to use a BIG dish!). Drizzle with remaining olive oil. Bake 60 minutes. Beans will be done when liquid has reduced, becoming syrupy and bubbly. Carefully remove from oven; season to taste with salt and pepper. - Mix basting oil and bread crumbs in a small bowl. 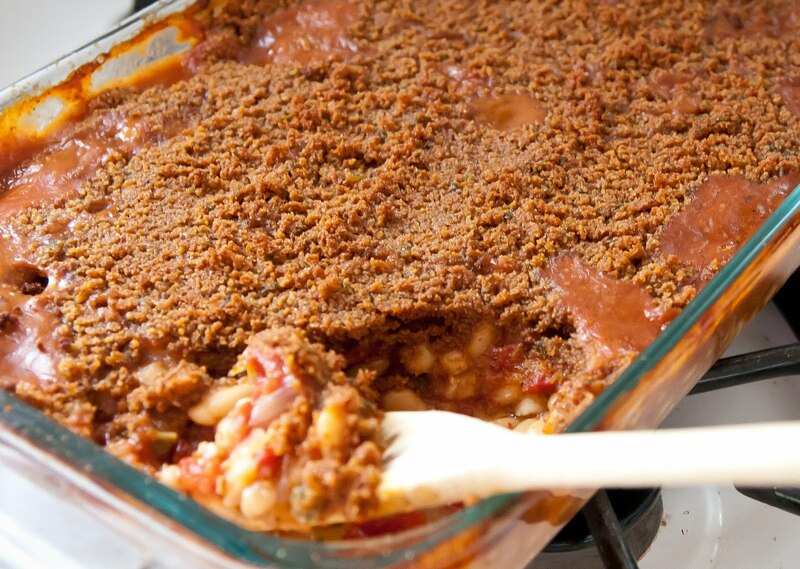 Place mixture over baked beans and return to oven; bake 20-30 minutes, until topping is brown and crisp. Disclosure: Even though I'm drooling over all things Wegmans-ish in this post, I've not been reimbursed in any way to do so. I just like their stuff that much. They don't even know that I exist, although if for some reason they should happen to find out and then decide to send me a crate of basting oil, I shall not complain.